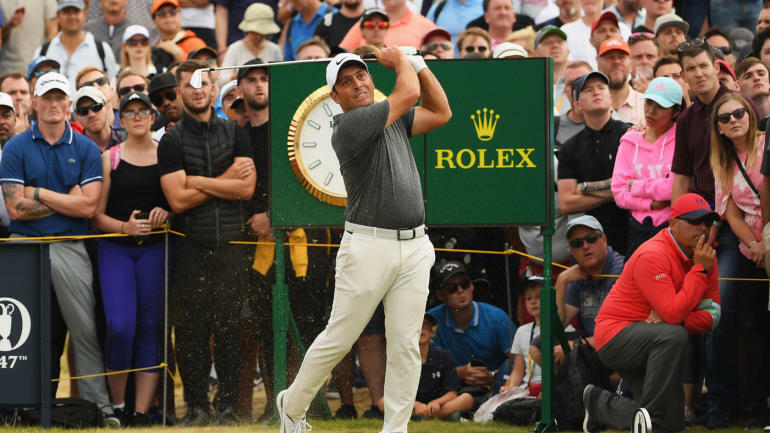 The 147th Open Championship provided all of the thrills any golf fan could ask for in a major, but when a leaderboard full of major winners started to slide, only Francesco Molinari was able to string together pars and hang on at the top. At one point, six golfers were all tied for first place, including the likes of Tiger Woods, Rory McIlroy and Jordan Spieth. Woods even held the solo lead at one point. Molinari, playing with Woods, was a runner-up at the PGA Championship last year and now has broken through as a major champion. Winning majors is a big way we judge golfers, and given the leaderboard he bested, it feels like Molinari should get bonus points for being the one who kept it together during a windy day at Carnoustie. 1. Francesco Molinari (-8): While the rest of the field had to deal with the consequences of their mistakes on tough day at Carnoustie, Molinari was the only one who could hold it together. His bogey-free final round was compliment of a great showing on and around the greens, chipping and putting his way to his first major championship. T2. Xander Schauffele (-6): It seemed like the 24-year old two-time PGA Tour winner played his way out of contention early with bogeys on No. 5 and No. 6 and then a double bogey on No. 7. But while while the wheels fell off for his playing partner, three-time major winner Jordan Spieth, Schauffele held things together and still had a chance to win with two holes to play. He's the real deal, and likely going to be a major champion sooner rather than later. T2. Justin Rose (-6): Rose needed a birdie on 18 to make the cut on the number on Friday, then fired a 64 on Saturday morning and put himself in contention to win The Open with another birdie on 18 in the final round. Up to No. 2 in the world coming into the week, Rose has been consistently at the top of leaderboards all year. T2. Rory McIlroy (-6): The ball striking has been there all week, but Rory couldn't get enough putts to drop early in the round to make his late charge be enough to win. This is the third straight top-five finish for McIlroy at The Open, and it's probably time we pencil him in as a top-10 lock from now on anytime he's healthy enough to play at this championship. T2. Kevin Kisner (-6): The putter that propelled him to the top of the leaderboard and put him in position to win after 54 holes finally cooled off on Sunday. Kisner shot a 40 on the first nine and quickly played his way out of contention but rallied with a couple of birdies coming in to the clubhouse. This is Kisner's best major championship finish (T7 at 2017 PGA championship) and a big jump for him at The Open (T54 best finish in three starts). T6. Tiger Woods (-5): There will never be another player who grips the sports world like Tiger, and the way everything seemed to stop as soon as Woods got near -- and then took -- the lead was a sweet hit of nostalgia for fans everywhere. What followed on the final nine holes was a reminder that even playing great golf isn't enough to win major championships, and while Woods certainly had his game together this week, he didn't have that extra juice needed to avoid mistakes that cost him a shot to win. .
T6. Eddie Pepperell (-5): After failing to shoot in the 60s all week, Pepperell told reporters that he had a bit too much to drink on Saturday night and played Sunday morning with low stress and a light hangover. The result was a 67, the low round of the day, and his first top-10 finish at a major. T6. Kevin Chappell (-5): Always near the lead but never out in front of the pack, Chappell finished his Open Championship week with a grinding 73. At times he was in the mix, starting the day at 7-under and sniffing the lead at 6-under but didn't have a lot of scoring opportunities throughout the round. T9. Jordan Spieth, Matt Kuchar, Tony Finau (-4): Sunday was particularly disappointing for Spieth, because even while he wasn't playing well it wasn't until late in the day that winning no longer seemed likely. There were plenty of mistakes around the course from the leaders, but his 5-over 76 was the worst round from players who finished in the top 25. Miss anything? CBS Sports was with you the entire way Sunday updating this story with the latest scores, highlights and analysis from a fantastic final round of action Carnoustie. If you are unable to view the updates below, please click here.